It's 2018, What Are You Doing Without A Portable Charger?! "Here for a good time not a long time." —my phone on 10%. 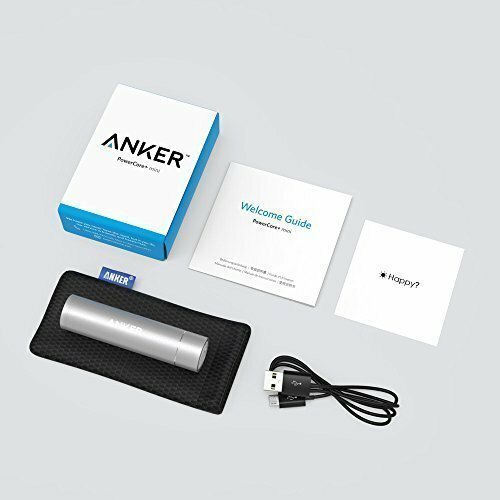 Not anymore with Anker portable battery! Hi there. Have you ever been in the middle of a very important text when all of a sudden your phone is on 1%? We've all been there, and that's why people are obsessed over this Anker lipstick-sized portable charger. It has your back when it need it most, holding up to 120% charge for the iPhone 8 and an 80% charge for the iPhone X and Galaxy S8. The battery pack itself recharges in less than four hours. And it lets you know how much juice it has! When the light on the pack is green, you're ready to plug in, if it's yellow you're still good to go but should plug in soon, and if it's red you need to plug that bad boy in for a bit! Your purchase includes a welcome guide, micro USB cable (to charge the battery), and travel pouch! It doesn't come with lightning cable, but not to worry; Amazon has that too! Get a four-inch cable cord (the perfect size for your bag) for $5.99. It's compact, lightweight, and has well over 16,800 reviews, 14,500+ of which are 5 stars! Get it from Amazon for $19.99–$23.99 (available in five colors). Now if only we could solve this problem too..